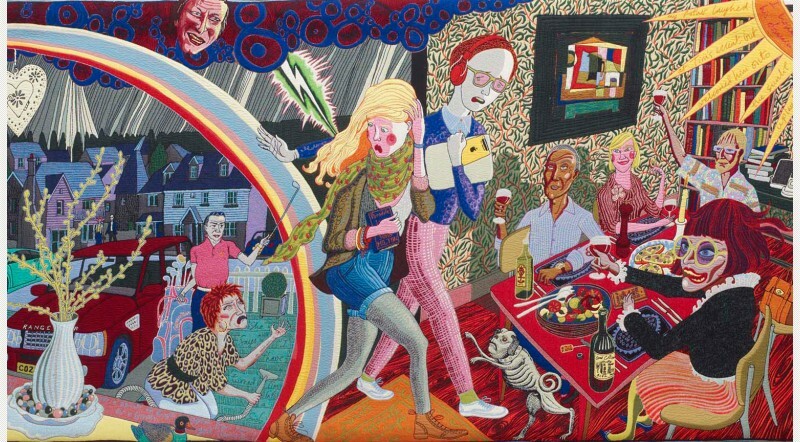 Until May 11th, Grayson Perry’s ‘The Vanity of Small Differences’ is at Birmingham Museum and Art Gallery (as it’s touring the UK). I watched the TV programme ‘All in the Best Possible Taste’, and was fascinated by Perry’s irreverent (but also benign) take on the small, aesthetic markers of taste and class in Britain, and the underlying cultural assumptions which these little signs denote. The tapestries stand alone, of course, but it is particularly appealing to see the people and objects he encountered depicted in these large tapestries. 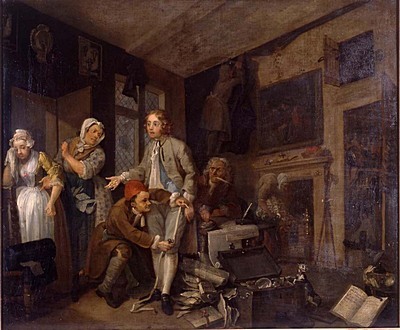 The series (six in total) is modelled on Hogarth’s A Rake’s Progress, in which the anti-hero goes from rich to poor by wasting his money, eventually dying poor and mad. Perry’s approach traces characters through class as well as life-stages, taking the opposite approach to Hogarth (from ‘The Adoration of the Cage Fighters’ to ‘The Upper Class at Bay’), and is highly intertextual and allusive, drawing on religious imagery, historic paintings, contemporary class markers (Willow Pattern wallpaper, anyone?) as well as the characters from the documentary. In looking at taste, class and social mobility (among other things), Perry touches on some serious subjects. The tapestries ask us what we worship if we do not worship God; how we find our place in the world; and how we can connect with other people who are different from us. The tapestries conjure modern life in all its beauty and ugliness, with a veneer of credibility given by the presence of familiar logos, objects and clothes. These are the kind of works one can stand in front of for a long time (if you’re not being jostled by the crowds!) noticing different things, seeing connections and disconnections, and wondering what society, class and taste actually mean in the twenty-first century. They may also make you smile, perhaps at a little joke, such as these mugs, or perhaps a little sadly. I saw them in London, July 2012, and found them fascinating. Ironic, smart and very topical. 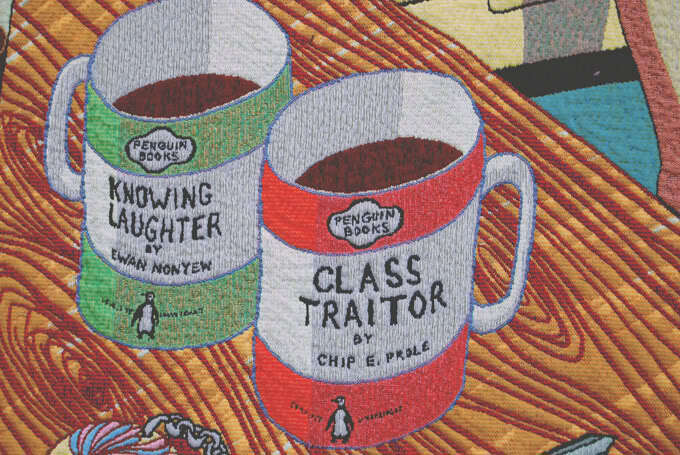 That the tapestries focus on social class/mobility (as well as the choice of medium) makes these works unique. Class is a conversation a lot of people -still, unfortunately- steer away from.